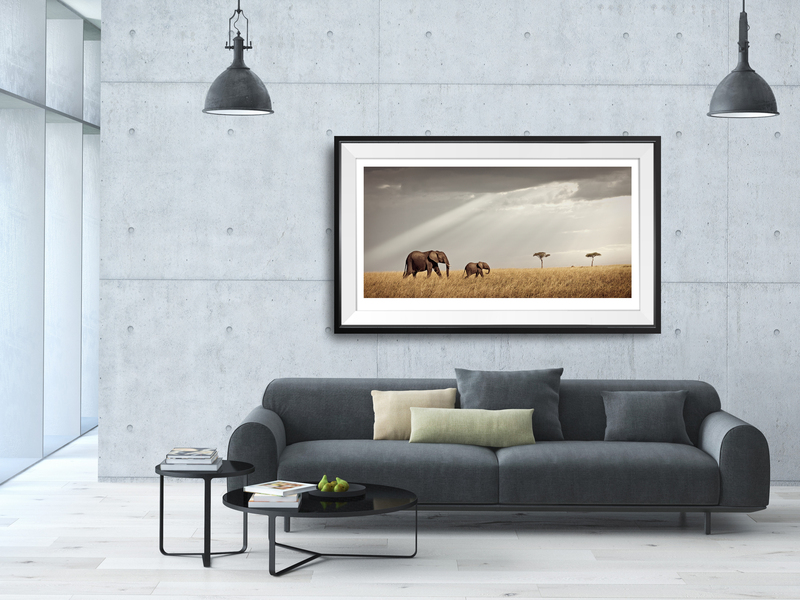 artwork calm enough for bedroom walspace and inspiring for any living room to dream of the next safari in Africa. I sit under the awning starring down to the river where the hippos usually gather. Today there is no sight of them. All I hear is the continuous patter of rain on the thick canvas of my tent. It is my last day of this photo trip to the Mara and I must to get out – one more time to draw in all the smells and sounds of the wilderness before returning home to the “ordinary life”. It is getting afternoon, although it is still raining, I insist of going out for a game drive because my experience tells that you never know what to expect. The Velcro of the removable side covers of the Land Rover is worn out and fails to stick in its places. Slowly water presses through the little openings. I can hardly see anything through the fogged plastic windows. It doesn’t take much longer, my guide and I feel wet and cold. I believe the animals must feel the same, as there is not one in sight. The plains look empty and left alone. We stop the car. I open the old silver flask with tea. Quickly our cold fingers turn red around the hot cups. My Masai guide and I sit in the car both sipping our tea and talking about our so different lives and traditions. Time seems to stand still. Only after the flusk is empty and we feel the cold climbing back into our bones, we realize it’s probably better to return to the camp. With a heavy heart, I decide to cancel this excursion. While we are crossing the plains on our way back to the camp, suddenly, the sky opens up just a bit and enough for the sun to send some rays through the dark clouds. Like a miracle a mom and baby elephant appear from the left, marching with quick pace through the wet grass. What a beautiful farewell gift! It proved to me yet again that you should never stop trying. Only if you are out there you have the chance to experience the unpredictable.